From The White Poems (Barnwood Publishers, 2001). This poem first appeared in The Roanoke Review. 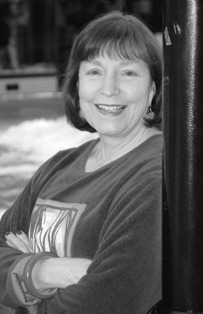 Barbara Crooker is the author of ten chapbooks, three full-length books, and more than 700 poems published in more than 2000 publications. She credits her achievements to perseverance as much as talent, and says, "Writing poetry is not putting down whatever comes into your head, and leaving it at that, never taking it any further. Poetry involves layers, and a lot of revision." Barbara lives in Fogelsville, Pennsylvania, and this poem is from a lyric narrative hybrid chapbook of poems, The White Poems, about a friend and neighbor with breast cancer. Read more about Barbara at www.barbaracrooker.com. This poem is replete with hope. Brings back memories of my own friends and their battles with cancer and leukemia, excellent images, especially the hope in the final line. I always look forward to the poem when I see your name on it. Thanks for the hope. Dear Barbara, You always come through. The perfect poem for an imperfect time in my life. TY. Having just gone through a difficult time in my own life, I can hardly express how meaningful this poem is to me. Barbara dear, thanks. You've done it again. I love this modern sonnet. So poignant-- all the images offer the sick friend hope. The last line is genius! I always love Barbara's poems. Today I noticed the power of the unexpected rhyme in ' insubstantial / as dust on a mantle' and appreciate that substance is built of many cumulating chimes. Thank you. Love the "plain," the "ordinary," the "small" leading to that wonderful last line,"a strand of hope against the icy odds." This piece was filled with wonderful expression!